"Find the strength. Find the courage. No matter what it takes... find the way home." Cold Mountain is an extensive romantic saga set during the last years of the Civil War and opens in July 1864 during the Siege of Petersburg. It covers both the home front and the battlefield and shows the devastating effects of war had on those fighting the war and those who are left waiting for loved ones to return. The major themes of the movie include redemption, longing, hope and faith. Inman, a wounded Confederate soldier, deserts from the war and fights to get back home to Cold Mountain in North Carolina and back to the love of his life Ada who he had to leave behind to go off to war. Ada longs for Inman's return as she struggles to keep her late father's farm from going under. Ada is broke and befriends a woman named Ruby. Together the two women fight to save the farm despite the horrible conditions that have ravaged the land. While Ada and Ruby deal with the home front, Inman encounters many interesting people and dangers as he makes his way back home. His journey is both dangerous and eye-opening as he encounters treacherous, sympathetic and desperate people during his travels. In addition, Inman suffers from starvation, rough weather conditions and he is constantly on the lookout for Confederate guards who are pursuing him for deserting. The movie is based on the novel written by Charles Frazier and is directed by Anthony Minghella. The all-star cast includes Jude Law stars as Inman, Nicole Kidman as Ada and Renée Zellweger as Ruby. The film also features a host of co-stars including Philip Seymour Hoffman, Donald Sutherland, Natalie Portman, Jack White and Giovanni Ribisi. Jack White of the White Stripes also contributed original music to the film. 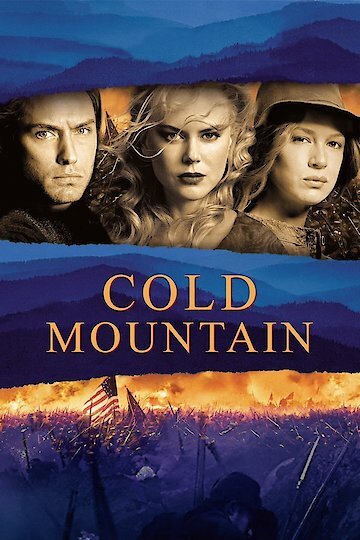 Cold Mountain was a huge hit and is a well-acted, dramatic and engaging movie that will capture one's heart. It was nominated for seven Oscars including Best Picture. Renée Zellweger won an Academy Award for Best Supporting Actress as well as a Golden Globe and Screen Actors Guild Award for her role. Cold Mountain is currently available to watch and stream, download, buy on demand at Hulu, Vudu, Google Play, FandangoNow, iTunes, YouTube VOD online.